Harvey Penick wrote “The Little Red Book” to teach golf enthusiasts the world over, fans and players, the nuances of the game. He succeeded brilliantly, and in the process, he inspired David Thorpe to do the same thing for the sport he has spent a lifetime coaching. Coach Thorpe, an ESPN NBA Analyst for the past ten years, has spent a lifetime coaching thousands of players the game of basketball while mentoring hundreds of coaches, NBA executives, and even a few owners. He is credited with being the first “basketball skills trainer”, doing for players what golf and tennis pros have been doing for years. 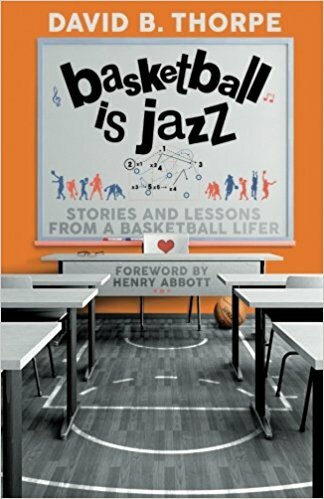 “BASKETBALL IS JAZZ: Stories and Lessons From a Basketball Lifer” is a glimpse inside how the game is best taught, played, coached, and enjoyed. Thorpe’s stories, about his NBA clients or his high school players from earlier in his career, will help the reader see the game better and appreciate it more. Parents looking for guidance will gain valuable insights into how they can better serve their children, just as coaches and players will learn better methods to improve their performances. And NBA fans will catch a long glimpse behind the curtain separating them from the players they love, seeing firsthand what these men do each day to make this incredibly difficult game look so easy to play.